There are several methods of determining the right amount of coals to use on your Dutch oven to produce the correct amount of heat. Here we have listed two of the more popular methods to do so. There are a lot of dutch oven books that tell you how many charcoal briquettes to put under and on top of the oven. Counting the number of charcoal briquettes is an easy way to cook since every coal is similar and consistent. Be aware though that different brands of charcoal give off different amounts of heat. As a general rule, you would use the diameter of your Dutch oven, and multiply it by 2. Example: for a 10 inch Dutch oven, you would use 20 briquettes, for a 12 inch Dutch oven, you would use 24 briquettes. Depending on the type of cooking you are doing, you need to make the heat come more from the top or bottom of the Dutch oven. For example, too much heat on the bottom will burn most baked goods. Not enough heat, and it will take forever to cook your dish. Baking - Most of the heat on top so the bottom doesn't burn. Use 2/3 coals on top and 1/3 underneath. Roasting - Heat distributed equally from top and bottom. Use 1/2 coals on top and 1/2 underneath. Simmering - Most of the heat from bottom. Use 1/3 coals on top and 2/3 underneath. Frying - All the heat from the bottom. Use all coals underneath. 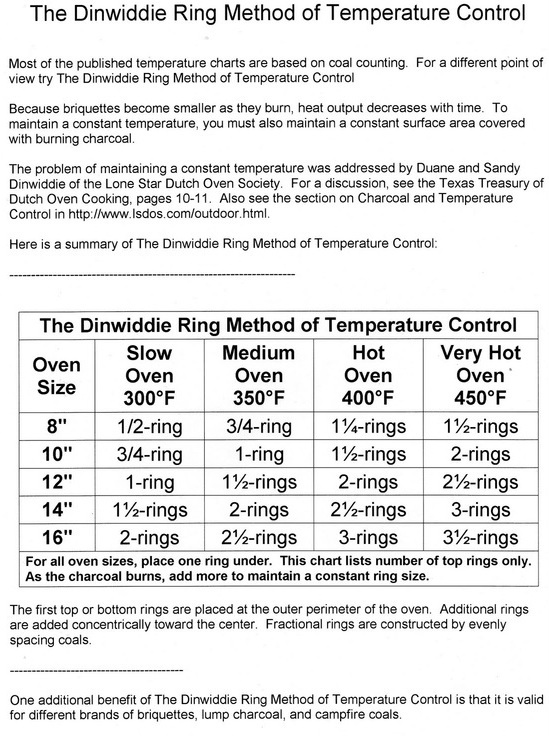 1 ring: If you make a circle of hot charcoal with all of the briquettes lying flat and touching each other, with spaces left out for the legs on the bottom rings, that is "one ring". The outside edge of the ring is lined up with the outside edge of the pot, top or bottom. For the record, I still use the coal counting method for the bottom heat. I take the size of the oven, subtract 2 and that is the number of bottom coals I use. I've found that if I use a full ring on the bottom I tend to burn my food. 1/2 ring: A "half ring" is the same size circle but with every other briquette missing. 2 rings: is simply a second ring just inside the first, with the rings touching. Full spread: Means to put all the briquettes you can (one layer deep, lying flat) either under or on top of the pot. The ring method is self correcting for the size of the briquettes used. If your charcoal has been burning a while, the pieces will be smaller and will put out less heat. But it will take more of them to make a ring, so you still get about the same temperature. As the briquettes burn down, you simply add more to fill in the spaces and keep the temperature constant. Duane Dinwiddie found that he could cook almost everything there is with just four temperatures--slow, medium, hot and very hot. For a 12" dutch oven, slow will have 1 ring on top and one ring on the bottom and be 300* (+/- 25*). Medium is 1 ring under and 1 1/2 rings on top and is 350* (+/-25*). A hot oven is 1 ring under and 2 rings on top and is 400* (+/-25*). A very hot oven is 1 ring under and 2 1/2 rings on top and is 450* to 500*(+/-25*). The following chart shows this method in detail. Starting out, your first set of coals will probably keep the oven hot for about 45 minutes. Although that may be long enough to cook many dishes, you certainly don't want to let those coals in place for 1 hour or longer meals. It's a good idea to check your oven every 20 or 30 minutes to see that the coals are still ok. You can replace the white ash and spaces left from burnt out coals with a few more fresh coals. Or, you can just remove all the original coals and replace them with a fresh new batch. Although the latter does require more coals in the long run, it is a better method for maintaining heat long term.